Brannan Mason, in a fit of perversity, sent me another set of Noble Audio Kaiser K-10 in-ear speakers. The difference? The universal fit. Yes, ten drivers per side, in something the size of the tears of joy you’ll be weeping when listening to them. These things are absurdly compact. By contrast, my custom K-10’s are nearly twice as large. How do they do that? The voicing for this variation on a Kaiser theme is pretty much identical to the custom. Pretty much. The difference? Your choice of which of those silly little foam and/or rubber tips you decide to use. I have a problem with universals, so let me be up front about that. I really don’t like the squeeze on the inner ear canal. It gives me the willies. Makes me feel like I stepped into a sensory deprivation chamber or something. With the right fit, the isolation is absolutely incredible, and by ‘incredible’, I mean creepy and weird. The bass response seems most impacted, though there is a little change in the upper-end, too, but in my experience, there really wasn’t enough of a delta to make me worry that I was missing out by choosing one over the other. It was far more “which one lets them sit best” than “which one sounded best”. My biggest issue was getting the tips onto the IEM — and then not freaking myself out with visions of them popping off and staying in my ear canal, needing a pair of needle-nose pliers to remove them. Because that would really annoy all the creatures currently living in there. In the Flagship IEM shootout, I spent some time talking about the voicing of the Kaiser K-10, so I’ll merely reference that in passing. Hitting the highlights, I found the K-10 to be an absolutely outstanding IEM. Voicing up-top seems to favor a gentle shelving down of the highs in favor of a non-fatiguing presentation, with a slightly elevated bottom-end, adding a bit more fullness to the lowest registers. Both tweaks off of straight-neutral are extremely well done, and the whole presents with a nice apparent linearity and what feels like a seamless top-to-bottom coherence. This is a reference-class sound, suitable for all kinds of music and all-day listening — and the better your sources, the better they’ll sound. With a handle on the voicing, I really tried to trip it up. I used crappy sources — they stayed crappy, and while the K-10 didn’t necessarily do them any favors, it didn’t make them sound worse. In fact, it was impossible to make them sound bad. Best of all, with those “great” sources, I finally fully appreciated how good they really were. That Astell&Kern AK240? Incredible, but reading many of the reviews, it’s hard to really get a handle on exactly how good it is. I’ve seen a ton of posts online about folks using it as a source into a back-strapped amplifier, or even into an external DAC and then into another amplifier. To me, that’s crazy-talk. Might work, but why would you bother? What we lose track of is the fact that your headphones, just like stereo loudspeakers, are part of a system. Speakers don’t do much without an amp and source. The whole set works together to make sound. That “concept” translates directly into portable audio, but usually the compromises of massive size-restrictions mean abandoning “great sound”. The AK240, great though it is, is going to be limited if the headphones matching to them aren’t able to keep up. Flipped around, it’s apparently hard to drive the bajeebus out of a pair of planar magnetic cans from something the size of a deck of cards. So, instead of strap-packing a brick together, maybe we should think about a different sent of cans as the best mate with that player’s form factor …. Anyway, rant aside, it seems to me that IEMs are flipping perfect for this application, and with the Kaiser — either IEM or Custom — I completely abandoned the idea of back strapping anything to the AK240. It was unnecessary. Paired together, I had a fully portable system that is every bit the competitor for those of us with “traditional” stereo systems. No, I’m not giving up my stereo. But going on the road just got a lot more interesting. Got a long flight coming up? This is the IEM to pack with your AK240. This mini-review was written back in late 2014, and was promptly lost after the little Universals unexpectedly had to go back to Papa. 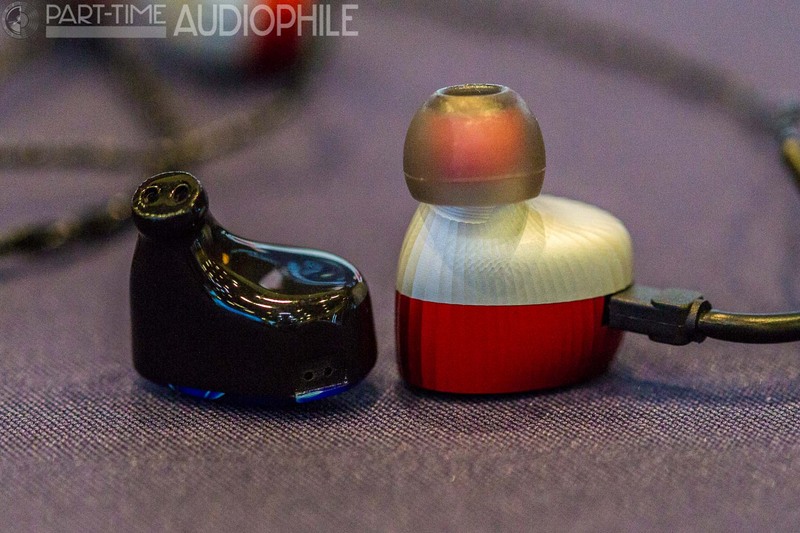 Anyway, since then, Noble Audio has released an updated version of the Kaiser K10 Universal. I spent some quality time with those new models at CanJam at Rocky Mountain. The new models feature a CNC’d aluminum chassis, which is now available in red/black and rose gold/black (update: these rose gold versions special editions are sold out). Sonically, these two are indistinguishable. Physically, the new models are modestly larger/taller. I will offer, again, that my personal preference is for the custom-made version of this magnificent in-ear monitor, but I will concede — reluctantly — that this may not always be the best option. Of course, I am completely at a loss as to why that might be, but perhaps that is just a wholly novel failure of imagination. That said, I will not look down my long, elegant and superior nose at anyone choosing to go universal. I have had several pairs of IEMs over the years, from inexpensive Sonys, various Shure, Sennheiser and others up to the beautiful AKG 3003i. I sold the AKGs to fund an amplifier upgrade in my home system and replaced those with the universal version of the Noble 3s. Excellent IEMs for the money. They have a slightly warmer more enjoyable than the clinical sound of the 4s. My only problem is the fit. I was able to get quite a good fit initially but eventually all universal fits slide out of my left ear after 15-20 minutes. I clean them religiously to make sure that they will stay, but this tells me that I need custom IEMS. I was planing on checking out the Noble Kaiser 10 and the JH Audio 13 v2. Whichever I choose, I will run initially into an iPhone 6s. Later I will strap a Mojo or equivalent amp/DAC to improve the sound. Your description of the slightly more fun sound with a small bump up in bass a slight easing off of the upper frequencies is what I am looking for. I travel a lot for work and I don’t want a fatiguing sound while trying to relax after a long flight. Thanks for the review. My dog ate my daughters Sennheiser IEMs, so I gave her my Noble 3s as an excuse to get custom IEMs 🙂 Your review came at the perfect time! So the bass was impacted? Care to say how? Tough to make a decision when it isn’t clear what the difference was. Better seal = better impact. The primary difference is comfort and fit — find one that sits right and you’ll get the biggest bang. Happily, they ship with various tips, so “the best” is between you and Darwin. With experience, we learn. As you mentioned, you have quite a large “growing edge” yet to experience. In the meantime, Beats makes very fine-looking in-ears that you can explore to your heart’s content.